Takuya Nii, a 32-year-old resident of Tokushima, Japan, lives a life that would make many outdoors enthusiasts green with envy. The talented writer, photographer and videographer divides his time between outdoors-related freelance work and employment at his family’s backpacker lodge on Mt. Tsurugisan (located on the southern Japanese island of Shikoku). 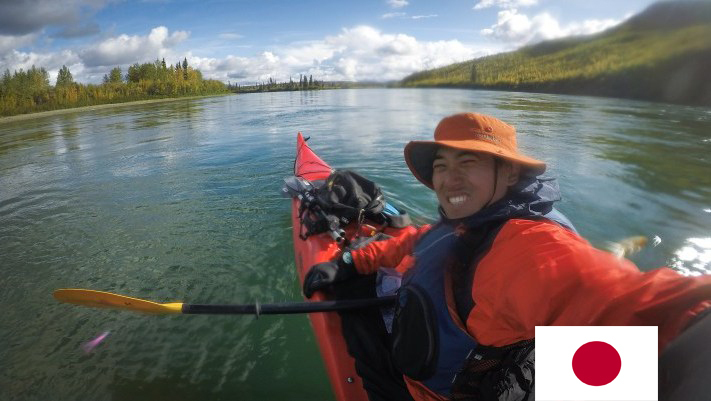 Tak, as his friends call him, has had his work appear in numerous Japanese publications and websites, and Be-Pal magazine (a long-running Japanese outdoors publication) recently ran a story on his 2016 solo canoe trip on the Yukon River. It was on the 2016 trip – not far from the confluence of the White and Yukon Rivers – that Tak met John Van Barriger (see accompanying bio). The pair’s similar interests, as well as academic backgrounds and work history, cemented a friendship that will see them tackle the entire Yukon River in 2018 to produce the documentary, “Bennett to the Bering.” In addition to still and video work, Tak also will be operating a drone on the adventure. Tak, who has been hiking since an infant and kayaking for 15 years, fell in love with the Yukon River, the vast wilderness of the North, and the friendliness of the Canadian people. In fact, he enjoyed it so much that he went back the following year, doing a late season trip down the Teslin and Yukon Rivers. Tak, who earned his bachelor’s degree in policy science, also is actively involved in the movement to prevent the construction of the Ishiki River dam in Japan. He recently returned from the area after doing video work to help raise awareness of the environmental problems and human impact associated with the project. Editor’s Note: Takuya Nii is one of six team members that will take part in the expedition, and is the sole representative of Japan. Read the other team members’ bios to learn more about this unique group.